Honda linked the Civic with the USA midterm elections with a TV spot featuring the theme of freedom of choice in relation to civic responsibility. The 30 second spot entitled “Freedom” debuted across the U.S. on Nov. 7, the date of the country’s midterm elections, and will continue to air on spot TV, cable networks including MTV, Fox and Comedy Central, and during national sports broadcasts for the NFL and NBA, among others. The spot opens with a Honda Civic car, a range of alarm clocks, and a young man sleeping in his bed. The man’s bedroom doors slide open to reveal range of seven cars. His body divides into seven versions, each with a distinctive set of clothes. The Honda Civic Freedom campaign was developed at RPA, Santa Monica, by creative director David Smith and Joe Baratelli, copywriter Camille Sze, art director Nathan Crow, executive producer Gary Paticoff. Filming was directed by Ace Norton via Partizan, Hollywood, with executive producer Ian Bearce, line producer Charles Spano, and director of photography John Zilles. Colorist was Beau Leon at The Syndicate, Santa Monica. Editing was done by Brad Waskewich at Rock Paper Scissors, Los Angeles, with executive producers Linda Carlson and Dave Sellars, producer Yole Barrera, and assistant editor Biff Butler. Visual Effects were developed at A52, West Hollywood, whose team included executive producer Mark Tobin, producers Heather Richardson and Mark Kurtz, VFX supervisor Kirk Balden. Sound was designed at 740 Sound Design, Santa Monica. Final mix was done by Nathan Dubin at Margarita Mix de Santa Monica. Music for Honda Civic Freedom is “Huddle Formation”, by The Go! Team, the Brighton, UK band. See The Go! Team MySpace site. 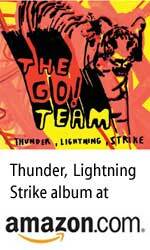 The track was featured on the band’s album, Thunder, Lightning, Strike.